Dussik's elaborate apparatus for scanning the head. Acta Neurochirurgica, Springer Verlag Wien, Volume 2, Numbers 3-4, September 1952, 379 - 401.
" The author's report concerns the recent results of his studies on the brain by means of supersonic techniques, called hyperphonography. This method was discovered by the author in 1937. It is based on the fact that the factors which bring about decrease in the intensity of a supersonic beam transmitted through a medium are entirely different from those of X-ray beams making X-ray pictures possible. The intensity of transmitted X-rays decreases more in the case of high atomic weight of the elements present in the medium, while their chemical combination and the structure of the medium do not influence it. In case of supersonics the attenuation of the beam depends chiefly on what might be called micromechanics of the material. Supersonic waves are due to elastic forces, contrary to X-rays which are very short electromagnetic waves; therefore we are able to understand the importance of the physical state of the particles, their motion, size, weight, and their mutual relations, i. e. the micromechanic structure. Speaking from a general point of view the importance lies in stresses, in hydration, and in the effect of viscosity on compression waves. Living cells are now colloidal systems, and most probably life and illness consist in a modification of these colloidal structures. Especially in the case of the brain by means of palpations on the operating-table, the neurosurgeon can explore the modifications of elasticity by touch and can make use of it in his surgical treatment. Numerous results of fundamental researches of colloidal chemistry show that supersonic waves can interfere with these structural modifications. In this waySchmid has recently obtained a diminution of polymerization leading to changes in viscosity up to 90 points. According to Grabar and his school, these modifications of viscosity are brought about by supersonic waves only in case of cavitation.Schmid's researches were made with an intensity of 10 Watt/sq-cm; in therapy a maximum of 2 to 4 Watt/sq-cm is used. Also in diagnostic application of supersonic waves their intensity must be kept below a safe limit, whereby cavitation is excluded. At the most we are now able to reach registrable results with the tenth part of the therapeutic dosis of ultrasounds. The author's fundamental idea was to use a bundle of ultrasounds in the same way as a ray of light or X-rays. In 1937 little was known of the application of ultrasounds on living individuals. For the not yet described diagnostic application, it was necessary for the author to test it on himself. This application is founded on a limited field of ultrasounds which, having penetrated through the object is recorded by means of a piezoelectric receiver (transformed into an electric current and then registered according to the known technical methods of high frequency) and can be photographed. In the special case of the skull, the object must be put under water. The skull, together with its contents, has sound characteristics similar to those of a liquid but not of a gaseous medium, and so transmission of ultrasound from air to the skull would lead to almost total reflection. Therefore we should have to use an intensity too large if we wished to use air as the surrounding medium. As a frequency, we must choose one which has a wave-length short enough for narrow beam formation, but at the same time not too high, so as not to allow an excessive absorption, because, contrary to the X-rays, the absorption increases with the frequency of the ultrasounds. 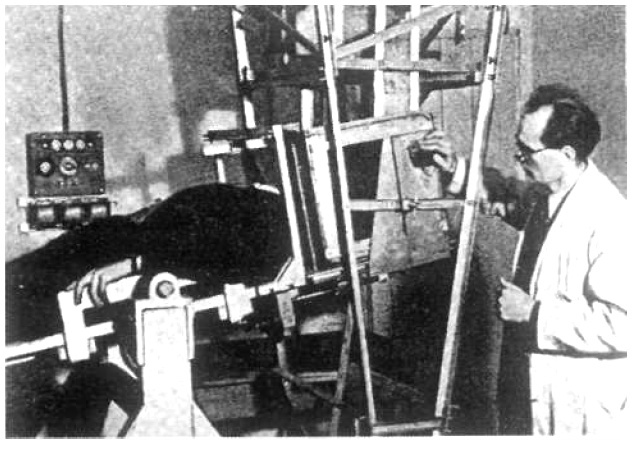 Having obtained the fundamental possibility to realize with this method an image of ultrasounds which gave an idea of the structural arrangement in the interior of the object, and after these personal studies which confirmed that these results are obtainable and that they are under the limit of intensity regarding physiologic or even harmful consequences, it was possible to pass from experiments on models and corpses to the practical test on healthy and sick brains. The first apparatus used for this purpose was constructed in 1946 by the author's brother, the physicist Dr. Federick Dussik. Unfortunately, because obliged to work with their own means, necessarily limited, and notwithstanding the great sacrifices and renouncements of any profit, it has not yet been possible to construct a new apparatus as projected by the author's brother. For this reason no progress has been achieved since the beginning. However, the author believes that the diapositives shown at this Symposium will prove in a satisfactory manner that good clinical results can be obtained in this way. As there are different structures in tumors, it is also possible to visualize tumors or also pathologic foci, as e.g. scars, directly on the negative. It is also possible to show tumors in their starting state. In the practice there also exist vibrations which do not depend upon the quality of the object. Their suppression is exclusively a technic problem; it is right to presume that the technical development may lead to a more exact ascertainment of localization. The value of the tests will be seen in the practice. The A. believes that a development of the diagnosis can be obtained above all in the first phase of cerebral tumors. Besides it is his opinion that important technical problems can be solved. Until now 300 studies have been made on patients with favorable results. The clinico-pathologic statistics are still limited, but the author can show that results obtained by his method in series of tumor cases were verified either by operation or by dissection. It has never been recorded that a cerebral tumor has a normal hyperphonogram, with the exception of those in the posterior cranial fossa, where only a ventricular hydrocephalus could be expected, but no positive image of a tumor. The hyperphonography does not mean either a danger or an annoyance for the patient, as it only lasts about 10 minutes. The hyperphonography can be repeated several times, so as to observe the development, and successively the results of therapy in the case of cerebral tumors. The author believes it is advisable to recommend the development of this method. "